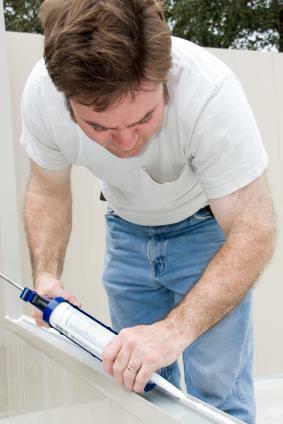 There are as many types of exterior caulk on the market as there are areas of your home to use it on. Make sure you use the right type of product for the application, and be sure to buy the best quality product you can find to ensure a long life for your home. Depending on the visibility of the area you are filling, the material of the area you are treating and the climate of the area you live in, you may find that one type of caulk is better than another for your home. Depending on where you are applying the product, and whether or not you are treating multiple areas at a time, you will use a product made of one of these materials. Always purchase a product that is rated to last a minimum of 40 years; most exterior joint fillers can last 45 – 50 years when used properly. If you want a paintable product that can be used anywhere on your home's exterior regardless of material, consider using a latex modified silicone caulk. This white material can be left as is or painted. It can shrink, however, and may not last as long as acrylic, pure silicone or polyurethane. Use it for yearly maintenance, such as filling the gaps around Masonite siding or replacing old fillers in between paint jobs. If you aren't sure what product is the best for your job, take the time to read the labels. Look for a material that is specifically designed for the material you are treating and for one that has the highest warranty possible. 50 to 55 year product is going to give you the best performance, provided it is also used on the materials for which it was designed. Always ensure the product you are using is meant for exterior use. When in doubt, use all-purpose caulk and inspect your home's exterior yearly to avoid problems caused by disintegration.